For theme park buffs, Disneyland's "Pirates of the Caribbean" is considered to be the gold standard of amusement rides. Its plot—a peaceful bayou boat ride rip-roaringly interrupted by a pack of pirates—has lent inspiration to pretty much every experience-based theme park ride since, from Universal Studio's "Jurassic Park" to the various Six Flags superhero roller coasters. And the impressive special effects, once way ahead of their time when it was built in the mid-'60s, are now standard practice for blockbuster attractions. From the moment the first animated skull and crossbones yells "Avast there!" ride-goers know they're in for a classic adventure. But there's one major (and majorly spooky) difference between "Pirates of the Caribbean" and its many descendants: the skeletal pirates strewn about the attraction were once made of real human remains. And some people, including former Disney employees, insist that a few of them still are. Disneyland's Pirates of the Caribbean, built in 1967, was the last ride whose creation Walt Disney himself supervised. Before the passenger boats were completed, the Imagineers pushed him through on a dolly and solicited his feedback. (Imagineers are Disney's term for park creative employees, a portmanteau of "imagine" and "engineer.") He loved it, and was especially happy that "each time guests go through, they'll hear something new and different." It was hard-won praise. Building the ride involved close collaboration between the machine shop, the animatronics team, and the sculpting and wardrobe departments, and the whole thing cost $15 million, about $106 million in today's currency and as much as the rest of the park combined. After creating such realistic mayhem, the design team was disappointed by "the faux skeletons of the period," which they found "just too unconvincing," reports former Disney producer Jason Surrell in his book Pirates of the Caribbean: From the Magic Kingdom to the Movies. So they hit up their friends at UCLA Medical Center and got some grisly props from the anatomy department. Eventually, as fake skeleton technology improved, "a new generation of Imagineers" replaced the real ones, which "were later returned to their countries of origin and given a proper burial," assures Surrell. Some fans, though, are not convinced about this last part. Rumors that several of the real skeletons were never replaced have been swirling in the Disney community for a while, and have become a popular topic of discussion on fan blogs in the past couple of years. In a ride most famous for its convincing illusions—besides all the animatronics, there's a "burning town" so realistic the Anaheim fire chief almost shut it down—these small pieces of (alleged) reality have drawn a lot of attention. People disagree on exactly which remains remain. After an investigation, Jason Petros of the EarzUp Podcast concluded that there are exactly three denizens of Pirate Town that were previously living—two skulls on a small island right after the second waterfall, and a whole torso trapped under a beam in a burning jailhouse. They cite "extra details on the inside of the skull around the nose" and "small holes and such" as evidence. 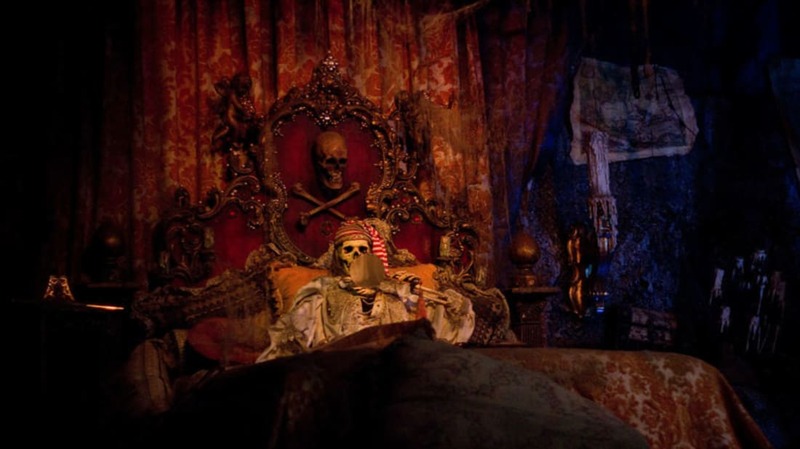 Josh of Disneyland Report points to a skull and crossbones decorating the headboard of an ornate bed, itself home to a skeletal pirate captain with a sleeping cap ("If you look closely, you'll notice they're darker and more aged than the rest of the skeletons on the ride," he writes). David Erickson of Fresh Baked Disney has heard that this particular skull was "donated" by an Imagineer. The blog DisneyDose even got a cast member to confirm this theory—"I've heard there are two more," she said, "but I haven't found them yet." As a very old ride that has gone through a number of renovations, Pirates of the Caribbean is a popular target for fan speculation and conspiracy theorizing. Those in charge have drawn online fire for making the attraction more "politically correct"—changing dialogue and props so that the pirates, for example, are chasing food instead of women. One of the original writers, Francis Xavier "X" Atencio, has referred to these changes as "Boy Scouts of the Caribbean." If the real live skulls could talk, maybe they could help the ride regain a little cred.